1. Mix the teriyaki sauce, soy sauce and grated ginger in a bowl. 3. Mix the chicken pieces with the cornflour. 4. Heat little oil in a large pan over medium flame. 5. Cook the chicken pieces for a minute on each side or till cooked. 7. Keep very little oil in the pan and remove the rest. 8. Add the mushrooms, cabbage, capsicum and onionss. 9. Cook for 5 to 8 minutes or till slightly soft. 10. Now add the pea pods and cook for a minute or two. 11. Add the sauce mixture (step 1) and cook for a minute or till warm. 12. Add the chicken pieces and stir well. 13. Serve warm with cooked rice. 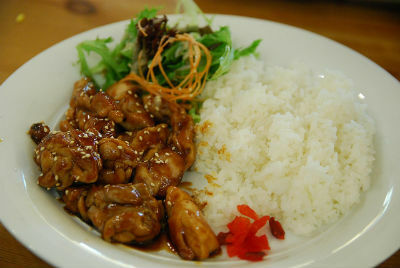 Feel free to comment or share your thoughts on this Crispy Teriyaki Chicken with Rice Recipe from Awesome Cuisine.